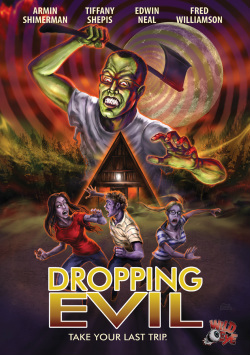 Dropping Evil: Dropping Evil is a 2012 horror/comedy directed by Adam Protextor and written by Louis Doerge. It stars Tiffany Shepis, Edwin Neal, Felissa Rose, and Fred Williamson. Dropping Evil was produced throughout 2008-2010 as part of a planned trilogy and released through Wild Eye Releasing in 2012. Plot: After his friends slip him LSD on a camping trip, ultra-nerdy Nancy hallucinates that they are evil beings and begins to systematically hunt them down. Meanwhile, a mysterious corporation monitors the entire event for their own hidden purpose.